I switched the blog to the new beta Blogger. If anyone is having problems posting please let me know & I'll re-invite you. Hopefully that will be the solution. I'm almost done with the hem. Thanks to Ann Marie, the row by row chart helped simplify the pattern. I'm whizzing along. The more I knit, I realized I'm growing out of love for "dewberry" color ( and was ready to rip it and start over with a different color). 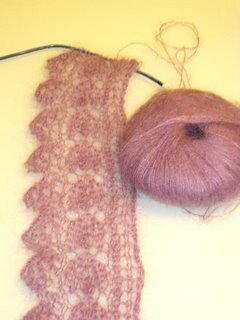 Fortunately, a friend who saw it and diggs the color, so I'm going to knit it for her bridal shower gift. Oh, I'm going to attempt to knit in the round, (don't like to seam). Hope I won't run into major problems with the decreases and increases at the sides. I'll take a tips, too. At the moment though, I have to put butterfly down and knit up a clown fish for a little baby.